With a presence in not just the United States but Canada, Puerto Rico, the United Kingdom and Australia, Williams-Sonoma is one of the best-known brands in home furnishing providing high-quality products for the home. 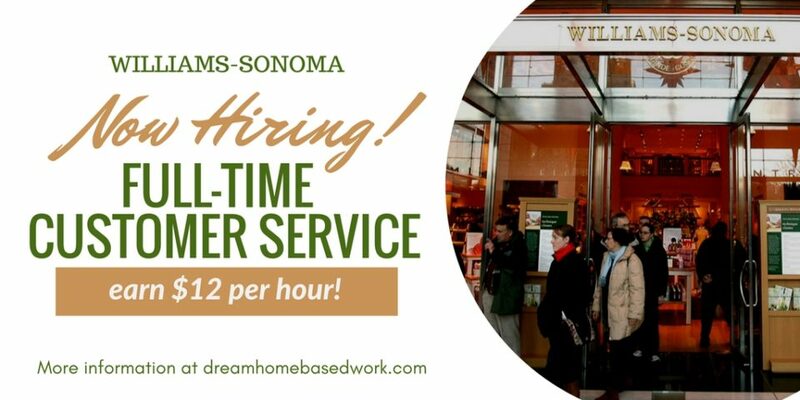 Williams-Sonoma is presently hiring full-time customer service reps to work from home in the U.S. The position is open to residents in Texas, Ohio, Florida, Alabama,Oklahoma, Nevada, North Carolina, and Georgia. The Full-Time Customer Service Representative is the front line expert in solving customer’s concerns and building lasting customer loyalty. The representatives accomplish this by providing world class customer service through confident resolutions for returns, replacements, credits, a status of their order placing, orders, and other aspects of customer service. You must be available for a two week training class. If you think you have what they are searching for, do go ahead and apply here work for Williams-Sonoma. While you’re here, make sure to view this list of other full-time work from home jobs!